SYDNEY (AP) — The ship involved in the recently halted hunt for Malaysia Airlines Flight 370 returned to port in western Australia on Monday, where officials from the countries that funded the fruitless search gathered to thank them and to defend their decision to end the hunt despite recommendations from investigators that it continue. 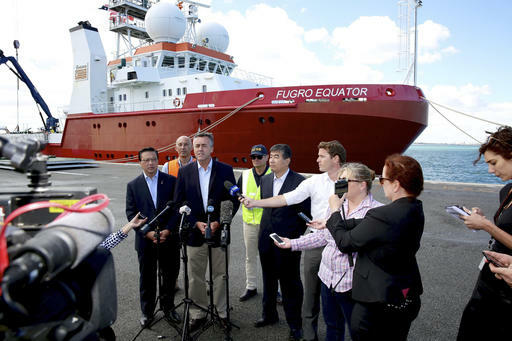 Transport officials from Australia, Malaysia and China met in the Western Australia state capital of Perth to greet the crew of Fugro Equator, who were ordered to return last week after the countries officially suspended the nearly three-year search for the plane in the Indian Ocean. The $160 million deep-sea sonar search off Australia’s west coast failed to find any trace of the plane, which vanished March 8, 2014, on a flight from Kuala Lumpur to Beijing. But Australian Transport Minister Darren Chester denied that the effort had been a failure, saying crews had managed to eliminate the 120,000-square kilometer (46,000-square mile) search zone as a possible crash site. Several relatives of the 239 people on board the plane have fiercely criticized the decision to end the search before finding their loved ones, and called on officials to scour a new 25,000-square kilometer (9,700-square mile) area immediately to the north of the old search zone that a group of international investigators recently identified as the likeliest resting place of the wreckage. The investigators calculated the possible new crash site by reanalyzing satellite data that tracked the plane’s movements and looking at a new drift analysis of debris that has washed ashore on coastlines throughout the Indian Ocean. The experts recommended in a report released last month by the Australian Transport Safety Bureau that the new area be searched. On Monday, the bureau’s chief commissioner expressed confidence that the plane probably lies in that new zone. “It’s highly likely that the area now defined by the experts contains the aircraft but that’s not absolutely for certain,” Greg Hood told reporters. But the three countries agreed months ago that the hunt would be suspended after crews finished combing the official search zone unless credible new evidence emerged that pinpointed the specific location of the aircraft. The investigators’ recommendation, they said, wasn’t precise enough to justify an extension of the search. Malaysian Transport Minister Liow Tiong Lai said he was meeting later Monday with a representative of the families to hear their concerns, but said Malaysia had no plans to fund a new search based on the investigators’ recent recommendation. “We need more credible evidence before we move to the next search area,” Liow said. Liow said the investigation into the plane’s disappearance would continue, with Malaysia taking the lead in analyzing future debris that washes ashore in the hopes it can provide clues to the location of the underwater wreckage. Australian officials would assist when needed, he said. Liow also contradicted an earlier statement from his deputy that the Malaysian government was offering a reward to any private company that found the plane’s fuselage. Liow said the comment last week by Deputy Transport Minister Abdul Aziz Kaprawi reflected his deputy’s personal opinion, and was not an official proposal by the government. Tags: asia, Australia, China, Malaysia, missing plane. Bookmark the permalink.